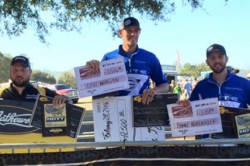 AMERICAN FORK, Utah – Gold Tip/Bee Stinger pro shooters Levi Morgan, Tommy Gomez and Chance Beaubouef finished 1-2-3 at the first Archery Shooters Association (ASA) Pro/Am tour leg of the year in Foley, Alabama from February 26 to 28. Following his ninth straight ASA Shooter of the Year title at the end of 2015, Morgan picked up right where he left off with another dominant victory. He led both days and extended his lead to 18 points through the final shootdown with his Gold Tip Triple X Pro shafts. Gomez and Beaubouef jockeyed for second in great shooting conditions, but on a course the competitors agreed was one of the most challenging they had experienced. ASA outdoor 3-D events feature multiple divisions. Pro Division contestants shoot two rounds of 20 targets from unmarked ranges. The five highest scores from the first two rounds qualify for the shoot-off to decide the winner. "There were an awful lot of prayers ahead of this tournament, asking God to guide my arrows and give me the strength to make the most of the opportunities," Morgan told the media. "I know how fortunate we are to be able to do what we do in this industry and I've just got to keep working hard every day to make the most of it." In addition to their Gold Tip arrows, Morgan, Gomez and Beaubouef were all also shooting Bee Stinger stabilizer systems. These stabilizers are fabricated with high-performance Smart Carbon Technology. Bee Stinger’s formula features a small diameter, lightweight carbon bar that is also extremely rigid. This combination has proven itself as the leading stabilizer on the tournament trail. Gold Tip, a Vista Outdoor Inc. brand, is one of the most recognizable and trusted names in tournament archery and in bowhunting. For more information, visit www.GoldTip.com.